IBM® Tivoli® Storage Productivity Center V5.2 is a feature-rich storage management software suite. The integrated suite provides detailed monitoring, reporting, and management within a single console. In addition, implementing the IBM SmartCloud® Virtual Storage Center (VSC) license with Tivoli Storage Productivity Center addresses new workloads that require massive scale and rapid pace, and accelerates business insight, by adding advanced analytics functions such as storage optimization, provisioning, and transformation. This IBM Redbooks® publication is intended for storage administrators and users who are installing and using the features and functions in IBM Tivoli Storage Productivity Center V5.2. The information in this Redbooks publication can be used to plan for, install, and customize the components of Tivoli Storage Productivity Center in your storage infrastructure. 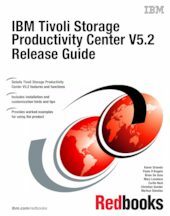 Note: This IBM Redbooks publication is written and based on Tivoli Storage Productivity Center V5.2.2. Sections in this book that pertain to advanced analytics, including cloud configuration, provisioning, transforming volumes, and storage optimization all require the IBM SmartCloud Virtual Storage Center license to be installed.